Leading Manufacturer of half wigs from Mumbai. We are instrumental in providing our clients a comprehensive range of Half Wigs that are processed under the guidance of skilled team of professionals. These wigs are used for giving stylish looks on various places like fashions shows, films, etc. 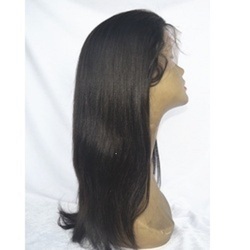 Offered wigs are available in different sizes, styles and cuts keeping in mind the diverse needs of the clients. Moreover, we offer these wigs at industry leading price to our valuable clients.